This recipe is great for a hot summer day when you don’t want to fuss in the kitchen. Early in the day blend the marinade ingredients then pour over the meat. Refrigerate until ready to grill. You can use this for chicken as well. Serve with jasmine rice and salad and dinner is done. In a blender combine all marinade ingredients and blend until smooth. 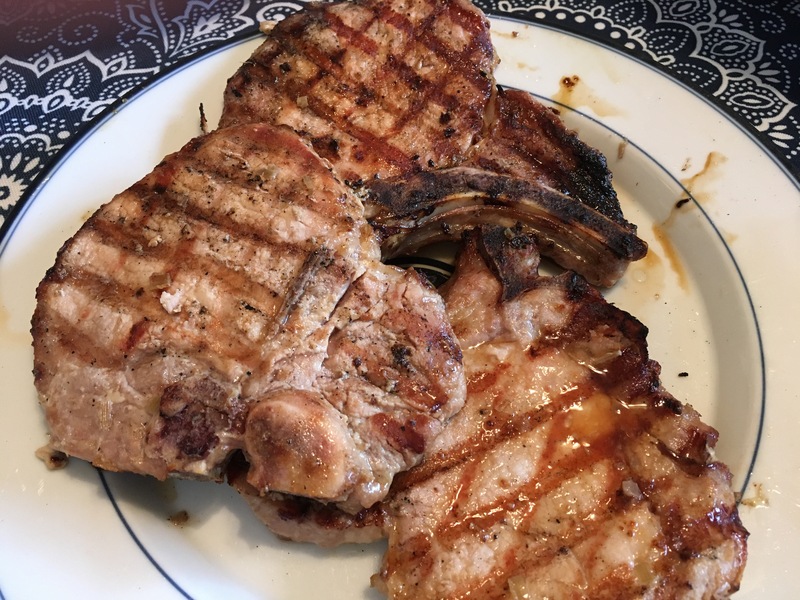 Place pork chops in a one-gallon ziplock bag. Pour marinade over pork. Massage the bag to distribute the marinade around the meat. Refrigerate 4-6 hours until you are ready to grill. Grill on medium heat until desired doneness. Serve 4. This entry was posted in Chicken, Meat Dishes, Sauces. Bookmark the permalink. Looks yummy. I just discovered lemongrass paste. It’s so good. I bet this is a great recipe. Thank you for commenting. I haven’t used Lemongrass paste before. I’ll have to look for it and try it.